This Swarovski Crystal Pearl is a perfect replica of round pearl beads. It is created using Swarovski Crystal Pearl technology. 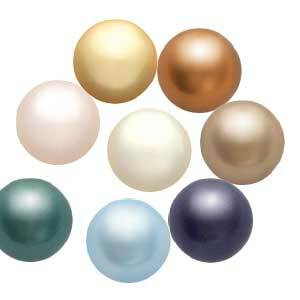 Swarovski Pearl coating is applied around a round crystal core in pearly layers. This comes in an an amazing range of pearly colours and sizes. The unrivalled qualtiy of Swarovski Crystal Pearls, the wide variety of colour and the endless possibility of combination with other bead, crystals, and components makes them ideal for creative designs.